A historically Greek district located on the Golden Horn, Fener offers a peek into Istanbul of old. The neighborhood is home to Byzantine and Ottoman-era homes, churches, and other buildings, along with the Greek Patriarchate. Walk the side streets where you can't help but pass historic buildings and trendy cafes, stores, and galleries. Fener’s atmospheric streets are an ideal place to wander. Notable buildings, including the unusual Fener Red School and the Church of St. George, dot the curving streets, while colorful cafes sit alongside Byzantine walls. A bike path runs along the water of the Golden Horn. Private and small-group walking tours of the Fener district often stop at the Church of St. Mary of Blachernae, Walls of Constantinople, ruins of Blachernae Palace, Ecumencial Orthodox Patriarchate, synagogues in the Balat district, and other historic highlights. Wear comfortable shoes to explore the Fener district. Fener is a must-visit for history and architecture buffs. The Greek Ecumencial Orthodox Patriarchate in Fener is an active place of worship, and not always open to visitors. The Fener district is located up the Golden Horn and is easily accessible by bus from the Eminonu pier. It’s possible to walk to Fener from Eminonu, though not all of the streets have sidewalks. Taxi service to Fener is an option if you prefer to avoid public transport. For maximum ease, book a tour that includes transportation. The scenic streets and bustling coffee shops of Fener fill up in the afternoon with locals and visitors. Come in the morning to beat the crowds and have the streets to yourself. Peak tourist season in Istanbul is June to August—visit just before or after for fewer people. Fener is adjacent to the neighborhood of Balat, a historically Jewish area that is dotted with synagogues. 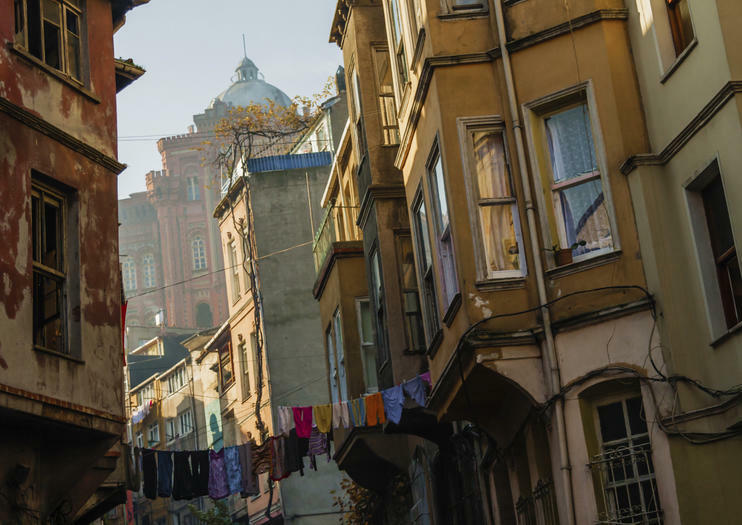 Combined, Fener and Balat provide an interesting look at the diverse history of Istanbul. Wander farther up the Golden Horn to Eyup, a Muslim neighborhood with a wide open square and a notable mosque. Discover Istanbul on a full-day tour that travels on foot and public transit to historic landmarks and local cultural hubs. Start by touring the Hippodrome, Blue Mosque and Grand Bazaar, then take a break for Turkish coffee, pastry and hookah (tobacco pipe). Visit the book and paper market Sahaflar Çarşısı, which started in the Byzantine era, then tour Istanbul University. Continue to Suleymaniye Mosque, the Spice Bazaar and the Church of St George before winding through the districts of Fener and Balat — the old Greek and Jewish neighborhoods. Realize the true impact of the Byzantine Empire on Turkey during this 3-hour guided history of Constantinople tour in Istanbul. Step back in time almost 1700 years and discover how Istanbul’s famous religious architecture and monuments took shape during this age of Christianity. Explore prime examples such as the Holy Virgin at the Church of St Mary of Blachernae, the Walls of Constantinople, and the ruins of Blachernae Palace. The legacy created by the Byzantine empire is uncovered on this tour. Discover the prominent and lesser known monuments, markets, and culinary creations of Istanbul on a private tour. In addition to the famous Basilica Cistern and Suleymaniye Mosque, the well-rounded itinerary takes you to the colorful neighborhoods of Fener and Balat. Enjoy traditional Ottoman dishes at a traditional restaurant near the often overlooked Chora Church. After the tour, relax in complimentary hotel drop-off.